Dunkin’ Donuts New Menu Items, Free Donuts and $10 Gift Card Giveaway! The observation bridge over Henderson Creek. Southwest Florida is blessed with a pristine coastal ecosystem brimming with remarkable creatures and breathtaking scenery. Located at the northern end of the Ten Thousand Islands on the gulf coast of Florida, the Rookery Bay Estuarine National Reserve represents one of the few remaining undisturbed mangrove estuaries in North America. The Rookery Bay Environmental Learning and Visitor Center, nestled within the 110,000 acres of coastal land and water that make up the Rookery Bay Estuarine National Reserve and just 10 miles from Naples and Marco Island city limits is the ideal destination for anyone who wants to experience the full force of southwest Florida’s natural beauty. The estuary provides an important habitat for many species of wildlife, as well as an ideal setting for visitors to enjoy. 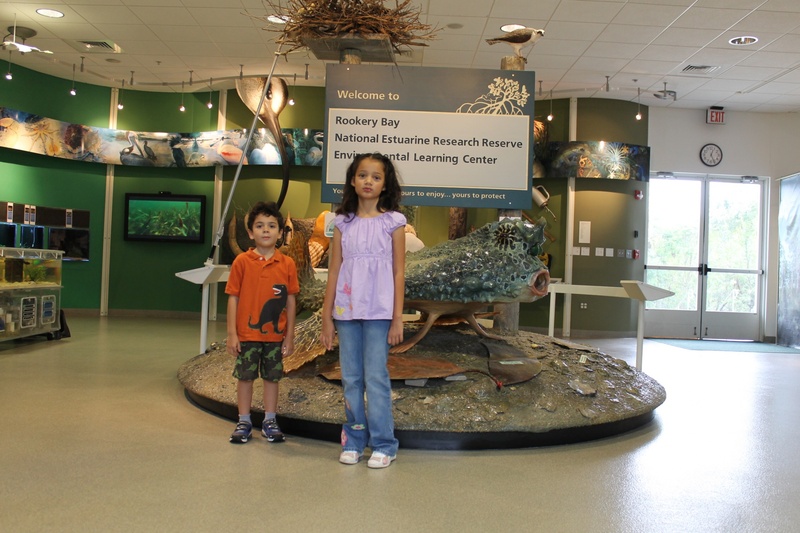 The Rookery Bay Environmental Learning Center offers a variety of outdoor learning experiences, hands-on exhibits and outstanding recreational activities. 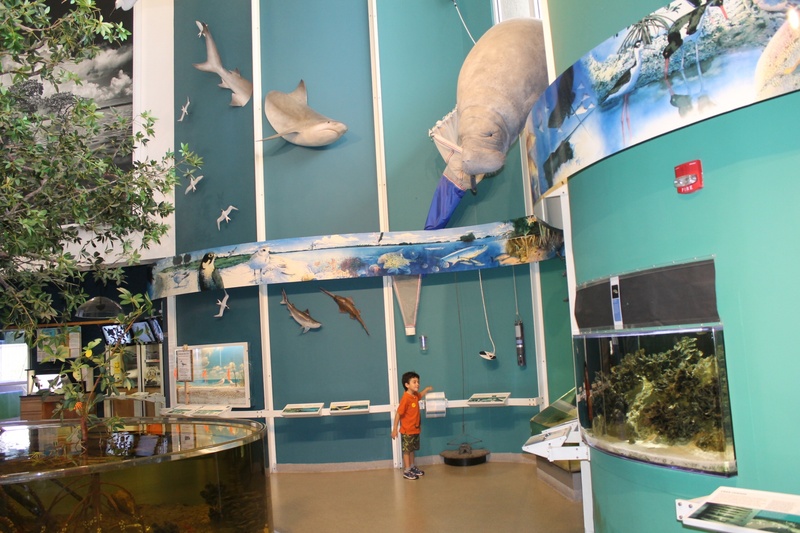 Visitors can take a guided tour or explore on their own by choosing among the wide array of activities from kids programs, interactive nature experiences, arts exhibits and films to nature trails and kayak rentals. Rookery Bay provides the ideal environment for nurturing children’s love for nature by giving them the opportunity to learn and making them aware of the importance and uniqueness of these southwest Florida ecosystems from mangrove-fringed waterways and uplands to freshwater wetlands. As soon as we arrived at the Visitor Center both of my children, ages 5 and 8, where captivated by the exhibits. They both where given a animal bingo card and where exited about the challenge of looking for all the different animals pictured. Rookery Bay Touch Tank. 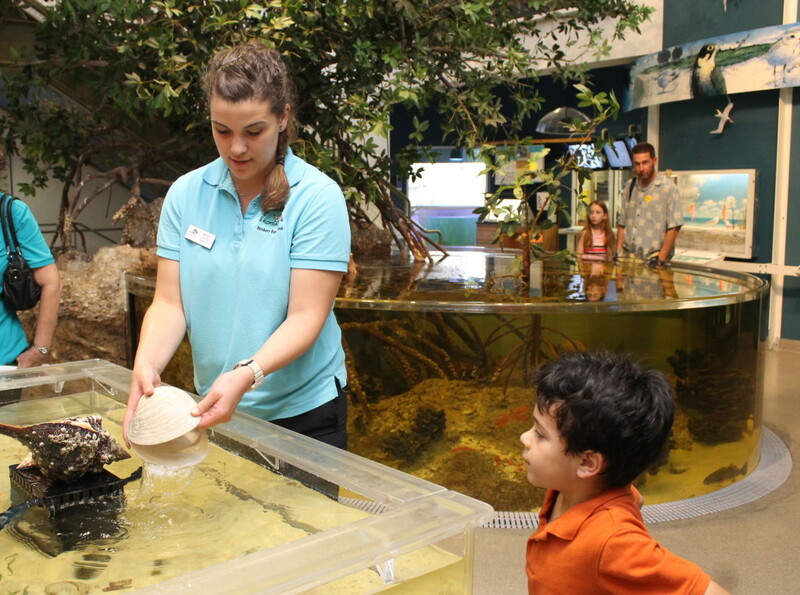 Check schedules as the touch tank is not available every day. We spent a few hours inside exploring and learning about the estuaries and the critters that call this rich ecosystem home. We delighted watching the fish in the 2,300 gallon mangrove aquarium, interacted with starfish, hermit crabs and conchs during a hands on presentation of the touch tank, watched a short film “Rookery Bay A Place To Be” and enjoyed looking at a collection of black and white nature photographs by the renowned Florida photographer Clyde Butcher. The art exhibits change periodically so make sure you check on Rookery Bay’s website so find out more about the exhibits before you visit. 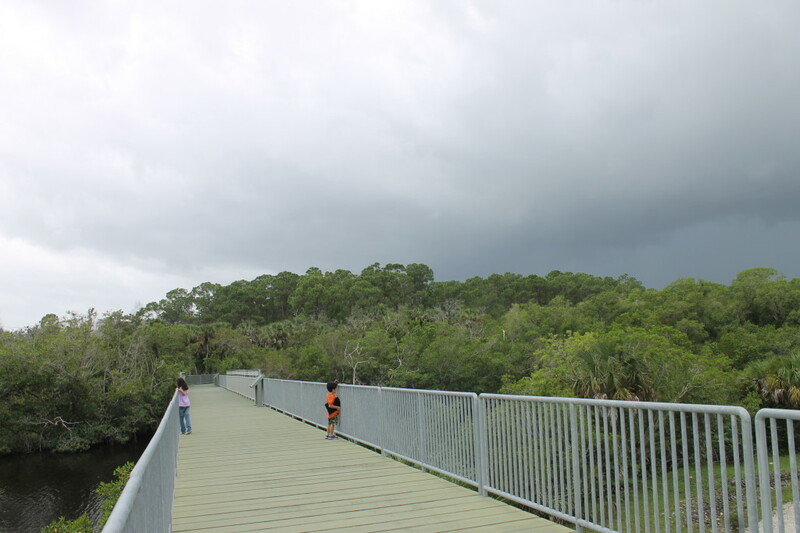 On the second floor mezzanine the exhibits focus around the history of the area and on building awareness about preservation, there is also an observation area where you can look out into the mangrove fringed Henderson Creek. Baby bull shark, moon jellyfish and Atlantic needle fish swimming in Henderson creek’s brackish waters. From the mezzanine we headed out into the foot bridge where we could get a beautiful view of the mangrove lined creek and in just a few minutes spotted two baby bull sharks, a couple of moon jellyfish and a Atlantic needlefish swimming in the brackish waters below! Observation deck over the creek. As the bridge sloped down on the opposite side of the creek we found ourselves immersed in the lush vegetation of the pine Flatwoods. Along the trail there where some reminders of what life was like for the early Florida homesteaders, among them a cement rainwater storage cistern more than one hundred years old, still intact. Further down the trail a narrow boardwalk leads onto an observation deck over the water. My children really enjoyed the day and learned so much and I know we will be visiting again soon when we are in the area. Rookery Bay also offers a wide array of educational adventures including birding workshops, photography classes and art lessons. For an on-the-water experience, check out their kayak or boat tours, and see the Reserve in a new light. 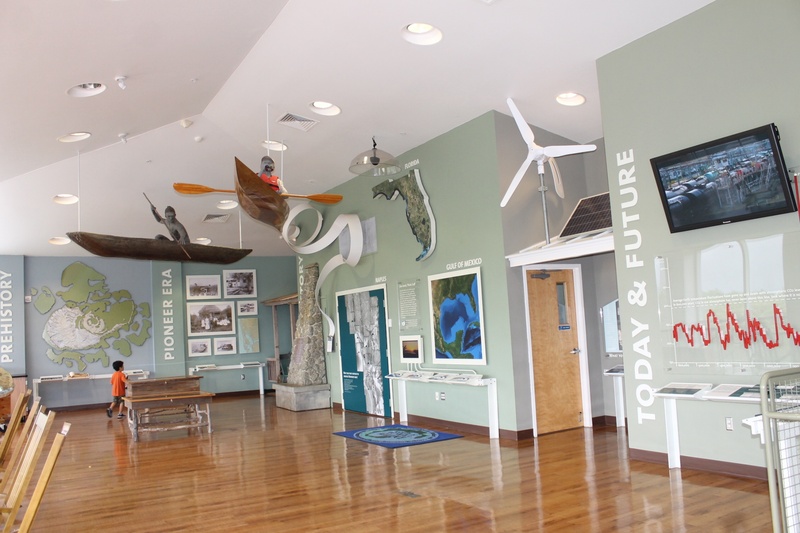 From May to October the Rookery Bay Visitor Center is open Monday through Friday from 9 am to 4 pm and admission is only $5 for adults and $3 for children 6 through 12. Fridays during June and July admission is FREE for kids ages 12 and younger with a paying adult. Each Friday there is a different theme from sharks and manatees to sea turtles . If you plan on coming during summer expect some puddles in the trails and don’t forget to bring insect repellant. 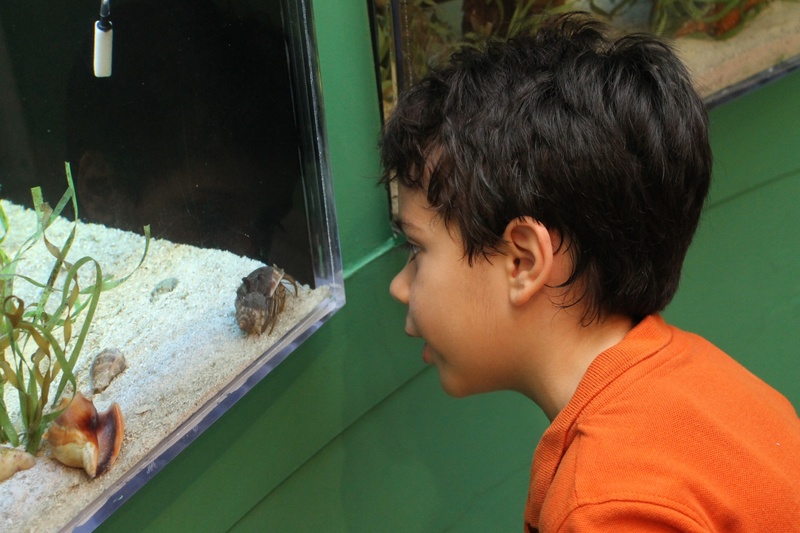 Peeking at a hermit crab. For more information about the Rookery Bay Environmental Learning Center and their educational programs or to find out how you can help support their mission visit the Rookery Bay website here and like their page on Facebook. Monster X Tour Is Back At Germain Arena Bigger and Better! - Win a 4 Pack of Tickets! I love nature centers like this! Definitely a place worth visiting. Thanks for the great info! Looks like a blast-so many hands on things to learn by! I wish to be able to visit Florida in the not too distant future. I go to Sarasota, FL, frequently and I’m always looking for great day trips. I’ll add this one to my list! Que lugares hermosos para visitar con los chicos!!! Gracias por compartir, para tener en cuenta si visito SWL algun dia. Qué bonito y entretenido para los peques! Todo lo que aprenden y se divierten es maravilloso! 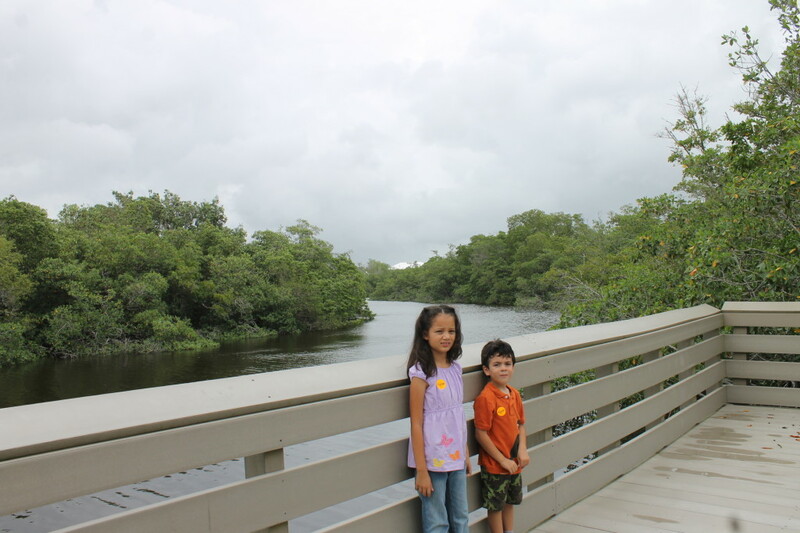 There is so many thing to do in south Florida, my kids love it. I will keep in mind this reserve for next time we visit Florida. Thank you Paula. This sounds amazing. I think my boys would love it. This looks like a cool place to take my boy. Don’t know about your kids, but I’m definitely learning stuff from your trips! What an interesting and beautiful place. Me encantaría poder visitarlo algún día. That looks like a really fun place to visit! Oh que lindo lugar! muchas Gracias por la recomendación! This definitely looks like it would be a lot of fun for children! I hope to take mine there someday! I am so jealous.. My boys would flip to be able to go someplace like this. they are all about learning the science of all things animals ect..